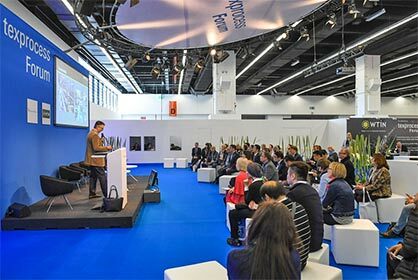 Within the framework of the Texprocess Forum, Messe Frankfurt is bringing an offshoot of its Fashionsustain conference to Frankfurt on 14 May. Fashionsustain is part of Neonyt, an event hub specialising in sustainable fashion during the Berliner Fashion Week. The innovative conference format adds pioneering, sustainable textile innovations to the dialogue and uses synergistic effects in the sector to revolutionise processes and production flows. The superordinate question, ‘Is Sustainability the Key to Textile Innovations?’, will be discussed in round table sessions with key players, such as Lenzing, Perpetual Global and Procalçado S.A. A keynote lecture by Micke Magnusson, founder of the Swedish ‘We are Spindye’ start-up, will address the economic need for sustainable business models and give action impulses. The subjects selected by DTB – Dialogue Textile Apparel – for the Texprocess Forum on 15 and 16 May spotlight those parts of the textile process chain most affected by digitalisation. With Holger Knapp, CEO of the Deutscher Fachverlag publishing company in the chair, Hans-Peter Hiemer of B4B Solutions will open proceedings with a keynote address on the digital transformation of the fashion business. This will be followed by a panel discussion entitled ‘Old hands, reckless young people – how to get the best from your team with 3D!’ with Professor Michael Ernst of Germany’s Niederrhein University, Dr Andreas Seidl of Human Solutions and other experts.